Pearl S Buck Birthplace Call To Action! 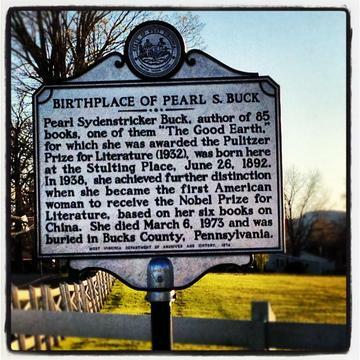 The Pearl S. Buck Birthplace Foundation hasn't added a story. The Board of Directors of the Pearl S. Buck Birthplace Foundation (PSBBF) seeks funding to complete the restoration of windows in the Stulting House, historic birthplace of the Nobel and Pulitzer Prize writer, Pearl S. Buck., located in Hillsboro, West Virginia. Restoration of the windows is an urgent priority for the Foundation. Water damage coming from the existing windows not only is destroying the visual integrity of the exterior of the building, but also is compromising the building’s structural soundness and jeopardizing the numerous artifacts on display throughout the house. We have completed the restoration of the windows on two sides of the home, and now need to complete this project in order to preserve this historic treasure. While a number of projects over the past decade have helped preserve the historical integrity of the birthplace, including the installation of a new cedar shake roof, new copper gutters and French drains on the house, a new barn roof, it’s become apparent that replacing the windows of the 160-year-old Stulting House is now imperative in order to ensure that this centerpiece structure of the birthplace grounds survives. The PSBBF began grant-funded projects to paint the house and restore the windows in 2013 under the supervision of the West Virginia State Historic Preservation Office; though to date funding has only been sufficient to restore some of the windows (12). While painting to the exterior of the house will be completed in 2016, we now find ourselves lacking funding to complete the remaining windows. The PSBBF is aggressively committed to saving and preserving the Stulting House, and is pursuing grant funding again from the State Historic Preservation Office and other sources, but we need help from you! To restore and replace the remaining windows will cost around $20,500. We are partway to our goal, but we still need to raise $10,000 in order to complete this critical project. That’s where you come in! We hope those of you who love the books of Pearl S. Buck, or who appreciate the beauty of her birthplace will consider contributing to this campaign. Thank you for your contribution and for your important role in preserving legacy of Pearl S. Buck! 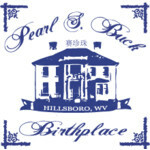 The Pearl S Buck Birthplace Foundation was incorporated as a WV 501c3 non-profit organization in 1968 to manage and maintain Pearl’s birthplace in Hillsboro, Pocahontas County West Virginia. The house was put on the National Register of Historic Places in 1970 and opened as a museum in 1974, a year after Pearl’s death. After nearly 50 years, the PSBBF continues to function as the overseer of the birthplace and grounds. We are governed by a 12-member Board, of which a 5-member Executive Board, consisting of 4 elected officers and one member at large, conducts the day-to-day business of the Foundation. During the summer months, the house is open for tours conducted by an on-staff tour guide. The Sydenstricker cabin, built in 1834 and the cabin of Pearl’s father Absalom, also resides on the Birthplace grounds. Pearl often spoke of the Stulting House where she was born June 26, 1892 as her home in America. In “My Mother’s House” she states “May it live again, my mother’s house, and may it prove to others, too, a gateway to new thoughts and dreams and ways of life”. It was her desire to leave a living legacy, not a museum. Her plea was that it should never fall into ruin. It is the mission of the Pearl S. Buck Birthplace Foundation to answer that plea. Please contact us with any questions or comments. Visit us at our website at pearlsbuckbirthplace.com, or find us on Facebook. The Pearl S. Buck Birthplace Foundation hasn't posted any updates yet. You can sponsor windows individually. The PSBBF will place a brass plaque with your name at the specified window denoting your generosity. The Pearl S. Buck Birthplace Foundation is managing the funds for this campaign. The Pearl S. Buck Birthplace Foundation is a verified organization.